A quick update on progress. As everyone will have seen, three chicks have hatched and are being well fed by the parents, while one egg remains. Given that night-time temperatures have been close to zero over the last few nights, and there have been sleet and snow flurries by day, just as importantly they’re also being well brooded. The first egg hatched on April 26th at around 20:45, the second on April 27 at around 13:00 and the third around midnight on April 28th. Below is a screengrab of the first chick just emerged, still wet and not yet dried out to show the white down they now have. The screengrab above shows the female disposing of the first egg shell just after midnight, with thanks to Trish for the image via Twitter – that’s dedication! And Alan has made a short video of the hatching of the second egg available, which can be watched here . The fourth egg is still being brooded and may still hatch – fingers crossed. Both adults are taking turns at brooding, and neither seems keen to give up their position on the eggs on occasion, as above when the male hunkered down to indicate to the female that he didn’t plan to move. Later it was the turn of the female to stay put, staring down the male when he came into the box. A longer piece will follow over the weekend, but keep watching for that fourth egg hatching and – please, please – another full house. This weekend marked four weeks since the clutch was complete, the fourth egg having been laid on Saturday 26th March. That means that hatching is imminent, all being well. A recent tweet on the Sheffield Peregrines Twitter feed (thanks to Paul L for pointing it out) had a link to a terrific Dutch website that monitors Peregrine nests and makes available a spreadsheet where you can see the locations, dates of laying and dates of hatching of over 150 Peregrine nests across Europe and North America, plus a few others. The details are taken from webcams, Facebook pages and blogs, and it makes for fascinating comparisons. The site can be viewed here . What emerges from this spread of monitored nests, almost all of which are in the northern hemisphere, is striking consistency for the date of the first egg laid in different countries: from what I can make out, the earliest first egg this year was 27th February (Brussels cathedral), then 28th February (Munich), 29th February (Rome) and at least six pairs with a first egg laid on 1st March, including pairs in Osaka (Japan), Kentucky (US), Saarbrucken (Germany) and Amsterdam. 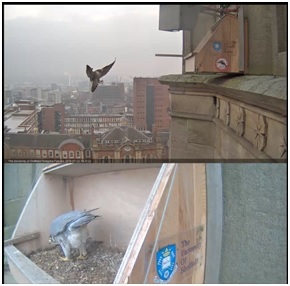 By contrast, the first egg laid by any of the 12 pairs monitored in the UK – which includes the St George’s pair – was the Nottingham pair on 14th March. This makes the UK relatively late in comparison to Belgium, Germany, Italy and the Netherlands, though not Poland, which has a similar spread of dates. However, the first egg laid of the monitored pairs in Canada was 19th April, when 2 separate pairs laid their first eggs in Edmonton. What this all suggests – with reservations about the sample size and length of the survey period – is that laying dates are earlier further south (Rome, Osaka, Kentucky, south-west Germany) and later further north (English Midlands, Minnesota and Canada). The other feature that can be appreciated from the Dutch spreadsheet is the number of eggs per brood, though for a few it’s not immediately apparent what particular colours mean. Of the 150 pairs I’m fairly confident I understand, 22 pairs have 3 eggs (though some of these may be lost or second clutches? ), 109 have 4 eggs and 13 pairs have 5 eggs. The average clutch size then is very close to 4, a marked improvement on the 3.65 cited by Ratcliffe’s 1980 study on the basis of 419 clutches in the UK. The 9% of pairs with 5 eggs also compares favourably with the 2% described by Ratcliffe. One explanation could be that Peregrines are now having better breeding success in terms of eggs laid that in the period prior to 1980 that served as the basis for Ratcliffe’s study, which would tally with the recovery from the effects of DDT that had led to the species’ dying out in many areas. Once again, however, there need to be reservations about the representativeness of the sample. A final detail to be gleaned is that of the monitored clutches that have hatched to date in 2016 there is a range of 28-34 days between the laying of the last egg and the first hatching, with most coming 29-31 days after the clutch is complete. As estimated when the St George’s pair completed their clutch four weeks ago, we can expect hatching to begin between 26th and 28th April, so in 2-4 days’ time. Keep those eyes peeled! And a final snippet to end with, another of those things I’d never really thought about until reading Tim Birkhead’s book: the St George’s chicks are breathing inside the eggs. How do they do this? Air clearly passes through the shell, but water can’t and the shell also provides a highly effective barrier against microbial infection. A fantastic design that is about to demonstrate another of its key features: hard enough not to be damaged by an adult sitting/ stepping on it or pulling it in under its body with its bill, but soft enough to enable the chick to peck through it and emerge. If you keep the volume turned up on the webcam, you just might hear the chicks peeping before they break through, though you’ll be very lucky if you do! Be that as it may, the next few days should prove exciting. We’re now over halfway through the incubation period and all appears to be going well, even if there’s not a great deal of action. I’ve spent a few hours down at St George’s on some early mornings and have seen an awful lot of the non-incubating bird sitting about on one of its several favoured perches near to the church. No photos to show for it I’m afraid! On further reading of Tim Birkhead’s comprehensive and very readable study of birds’ eggs, it’s been fascinating to learn about why – and how – eggs are coloured. The mechanics of ‘how’ are not fully understood, but there are some good hypotheses as to ‘why’. First, a quick comparison of eggs from some of the nests with webcams not too far from Sheffield, which I’ve noticed from the twitter feed. These, of course, are the eggs of the Sheffield pair, a deep russet-brown with some darker flecks. Next we have the unusually large clutch of the Lincoln cathedral pair, markedly paler in their background colour and with reddish blotches. Then it’s the Wakefield pair, whose ringed male is tantalising us with thoughts that he may well have come from the birds ringed in Sheffield in May 2014. Perhaps he followed the copy of the St George’s nest platform that Jim Lonsdale took up to Wakefield! These eggs are obviously darker than Lincoln’s but paler than Sheffield’s. And finally Nottingham’s pair, also with four eggs. These are the closest in colour to the Sheffield clutch. So there’s quite some species variation between clutches, and individual females are known typically to lay the same number of eggs from year to year, and the same colour. Which brings us to the first hypothesis as to why eggs are coloured and/ or patterned: the ability for a bird to recognise its own eggs. Given that Peregrines do not nest communally and are extremely unlikely ever to find confusion as to which egg is theirs among many in close proximity, this seems a non-starter. The second idea is equally unlikely: as a means of avoiding brood parasitism. Tim Birkhead describes as an ‘arms race’ the struggle for some species to keep the design of their eggs complex enough to allow them to identify eggs laid in the nest by parasitic species, such as cuckoos or cuckoo finches. This is not a problem faced by Peregrines, so that’s two strikes. The third notion revolves around camouflage and conspicuousness. Over the last few years, it’s been evident that the Peregrines attack Crows, gulls and other raptors when they overfly the nest site (as above, taken when an Osprey passed St George’s previously), so there may be some merit in considering the role that colour could play in camouflage, with darker eggs less likely to be noticed by passing potential predators. Not entirely convincing, I agree. One fascinating experiment to explore the benefits of white eggs in relation to darker eggs involved painting Ostrich eggs (which are white) dark brown, with the result that the darkened eggs were 3.6 degrees C warmer than the white eggs. In very hot regions (so not Sheffield!) this can be a problem, as it can raise the temperature of the egg above the limit for survival of the embryo, but in temperate regions it may be beneficial to produce darker eggs to maintain a higher temperature when they are not being incubated. This might be especially relevant in the case of Peregrines, with the first laid egg(s) routinely left unincubated for extended periods in the early stages. Perhaps. However, that still wouldn’t explain the variation between the clutches shown above, all of which are in the same climate zone. I’ll leave that one to the scientists… So many unanswered questions. 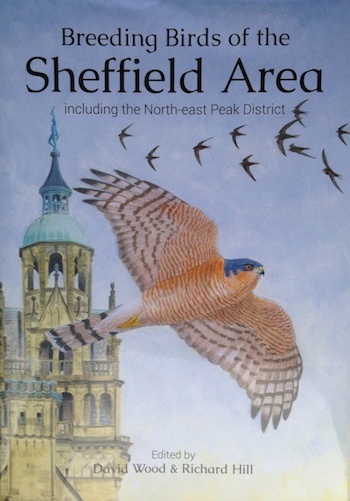 As you’ll have gathered, Tim Birkhead’s book is one I’d heartily recommend: not only does it provide answers to many questions about birds’ eggs and their success, it also makes you think about things you’ve never thought about, even if once he raises them you wonder how you can have never considered them before. So, 12-14 days to go before the St George’s clutch are likely to hatch: fingers crossed!